*As detailed in Item 19 of Saladworks, LLC's Franchise Disclosure Document. Building on our enormous success, Saladworks is undergoing a massive growth spurt. With the addition of Commerce Bank founder Vernon W. Hill, II to the executive team, Saladworks plans to open its 1,000th store in 2012, utilizing a "turbo-charged" growth model. The foundation for this growth will be creating "fanatical fans" of the Saladworks brand. Saladworks plans to increase its strong customer service in every store providing a fast casual dining experience never-before-seen in the food service business. 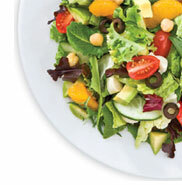 Simply stated; Saladworks will turn customers into fans… and we want you to be a part of it. Saladworks takes your success personally. Training and support are hallmarks of our system. From the inception of your franchise agreement through the grand opening and beyond, we offer step-by-step assistance to ensure success. "As a Saladworks franchisee, I took advantage of the great business opportunity and support team Saladworks provided. Today, I'm working on my eighth location and have financial freedom." What types of franchises are available? Individual, Multi-Unit and Area Representatives. While restaurant experience may be helpful, Saladworks seeks franchisees with a business management background and people skills. What type of training do I get? Click the button below and a franchise licensing manager will contact you. This is not an offer. An offer can only be made by prospects filed first with the Department of Law of the State of new York. Such filing does not constitute approval by the Department of Law. There are certain states that require the registration of a Franchise Disclosure Document (FDD) before the franchisor can advertise or offer in that state. The offer and sale of a franchise can only be made through the delivery and receipt of an FDD.